I was back in Central Otago last week where every year is the Year of the Rabbit. The farmers here say there are so many rabbits that if you clap your hands loudly you can see the hills move. Believe it. Before I had a chance to put my hands together, I’d already trodden on one. We both got a fright but the farmer just shrugged and told me he’s facing costs of $30,000 to poison them this year – there are far too many to shoot. Ironically, on this last trip I’d come to Central via Dunedin where a pie man was bemoaning the fact he couldn’t afford to make his Poacher’s Pie because the price of rabbits had gone through the roof. He was paying $16 a shot which gave him just 330g of meat. I’m not sure how much a hunter gets for a rabbit but I’m guessing the added cost must be in the processing. Whatever the reason, it seems ridiculous that only the best restaurants can afford to serve up a pest that’s hit plague proportions in parts of the country. 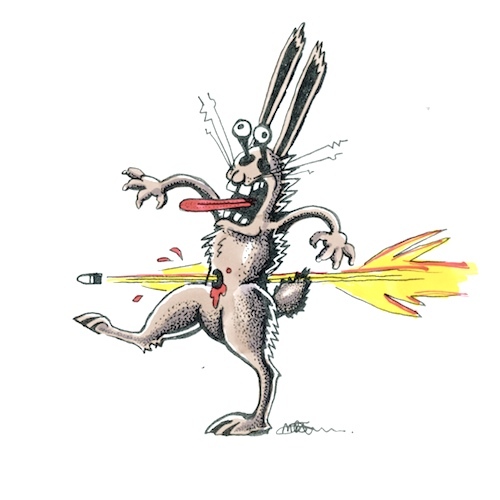 Having seen the problem at first hand, I figure the best thing you can do to a rabbit is give it a bullet, skin it, cook it and shred it into little pieces. 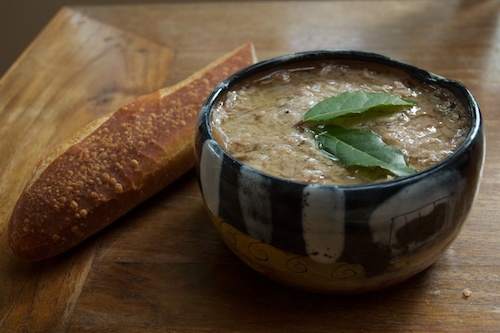 Here’s my recipe for rabbit rilletes. I used to make this in France where the rabbits are farmed. They’re plumper and meatier than our wild ones but they come with their heads still attached, which I always found a bit gross because without the fur their eyes are big and gollum like. NZ rabbits are skinnier so I use a higher proportion of fatty pork belly. 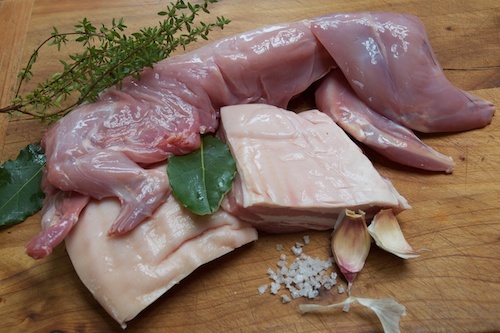 Joint the rabbit into 6 pieces and slice the pork belly into thick chunks. Rub salt, pepper, garlic and herbs all over the meat and leave in fridge overnight. Remove from oven and leave until cool enough to handle. Pick out the bay leaves and herb twigs and strain off fatty juices. Pull meat off bones and place in large bowl. 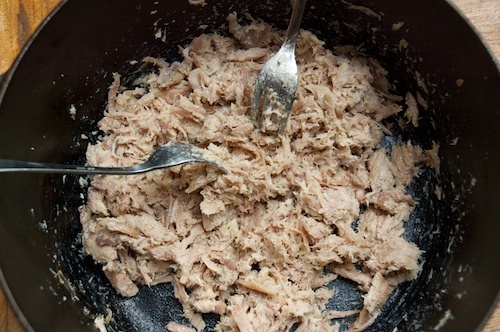 Using two forks, shred the meat finely, taste for seasoning and pack into a serving bowl. Pat down with a wooden spoon and pour a thin layer of the reserved fat over the top. Chill and serve with toasted bread and pickles. 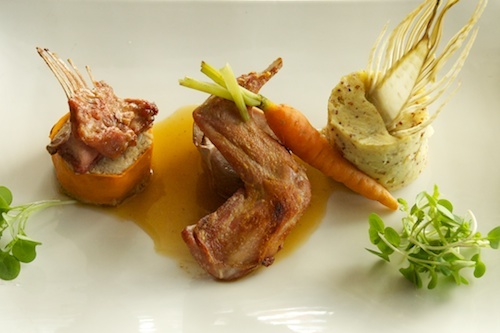 If you’d rather leave the cooking to someone else, here’s what chef Pascal Bedel can do to a rabbit at Le Canard restaurant in Wellington. 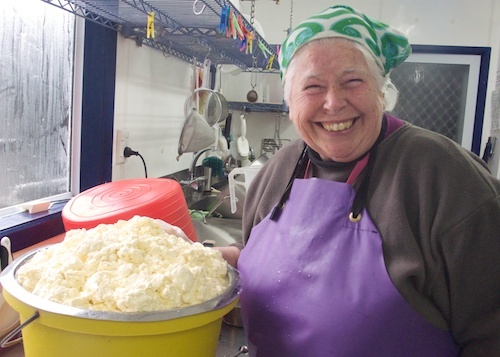 Cheesemaker and thorn-in-the-side of the food safety bureaucrats, Biddy Fraser-Davies, is hopeful her experience with officialdom will improve the lot of her fellow artisan cheesemakers. Having been threatened with closure for insufficient record keeping she is now filling in a ridiculous amount of forms for each cheese and complying with a testing regime that’s costing a small fortune (see last post). However, her undoubted frustration is tempered by the knowledge that she is proving her point: the food safety authority’s one-size fits all policy is unecessarily onerous and needs to be re-jigged to fit the needs of the country’s small cheesemakers. The information she is collecting, in the form of a steadily increasing pile of folders and lab reports, will be used by the Ministry of Agriculture (MAF now incorporates the NZFSA) to help design a pared down Risk Management Programme (RMP) for micro cheesemakers who milk their own animals, produce less than 1000 litres of milk per week and only make hard cheese. Don’t hold your breath – the wheels of officialdom are moving ever so slowly – but the following letter, elicited from the Minister for Food Safety, Kate Wilkinson, gives Biddy some hope. And if her dogged persistence pays off in that regard, Biddy intends taking her campaign to the next stage. She’d like to see the Risk Management Programme extended to include artisanal cheeses made from raw milk. I’ll keep you posted. 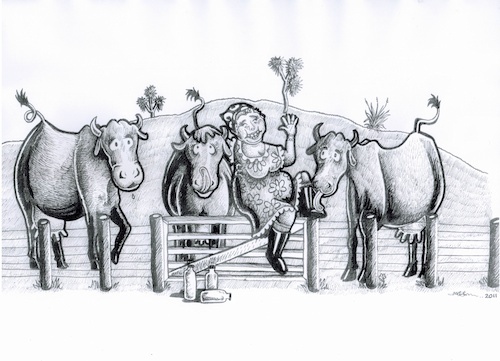 This is Biddy Fraser-Davies, the celebrated cheese maker from Tararua with her three cow herd: Sally, Molly and Emily. Between them, and notwithstanding the needs of their own offspring, the jersey girls provide just enough milk to support Biddy’s small cheese making business. She produces two naturally rinded farmhouse cheeses each day and sells them to people who like to come and pat the cow that produced the milk that made the cheese on Cwmglyn Farm. And what’s wrong with that? Quite a lot, apparently. The food safety people seem to think Biddy is a potential menace. She may not look it, in her pink crocs and purple apron, but the woman is dangerous; her cheese may constitute a health hazard. Not because her practices are unsanitary – all agree her standards are exemplary – and not because her cheese is substandard – it passes all the tests with flying colours. No, officialdom has it in for her because she failed to fill out the forms. The Food Safety Authority woke up to the fact after Country Calendar profiled her last year. They came down on her with a tonne of paperwork and have spend goodness knows how much tax-payer money checking her out. It would be funny if it wasn’t so tragic. I spent a few hours with her recently as she made a batch of cheese, and I watched her dutifully document every step in the process. There was a form to record the heat treatment of each batch of milk from each cow and another that covered the cheese making process. All up each cheese required 7 temperature readings, 6 ph tests and 14 time checks. And it didn’t stop there – the documentation followed each cheese through pressing, maturation and point of sale; all in the name of traceability. Now that’s probably quite a sensible precaution for a big factory but it doesn’t translate to a dairy the size of Biddy’s. She has to fill out these forms for every cheese she makes. The compliance cost so far, including lab testing offsite, has come in at $5,000 – a huge chunk of her $20,000 turnover. It’s enough to drive you mad – or out of business, and you can’t help wondering if that’s the idea. Are artisan cheese makers really such a threat to our dairy industry? 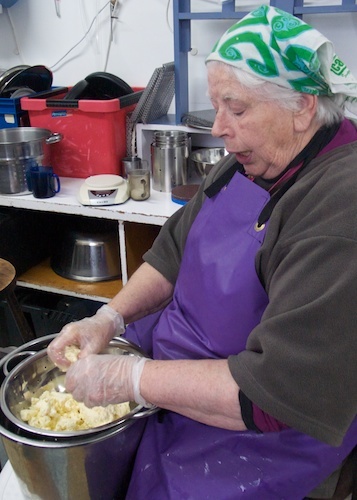 Biddy has been making her cheese without a problem for 8 years. Her equipment is spotless, her cows are well cared for, their milk is checked regularly. 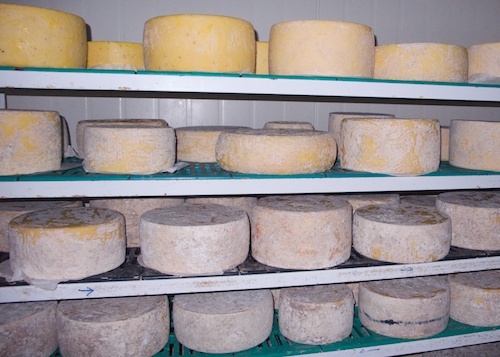 You would think risk management requirements could be tailored to suit the size of small dairies like Biddy’s – especially now we are seeing such a resurgence of small scale cheese making. Encourage compliance by all means but don’t let bureaucracy kill the artisan culture. Banon. Un fromage de chèvre au lait cru. My Mothers’ Day treat: un fromage de Banon, an AOC raw milk cheese made in Provence and imported by Ludovic Avril of Le Marché Français. It really was like unwrapping a present. 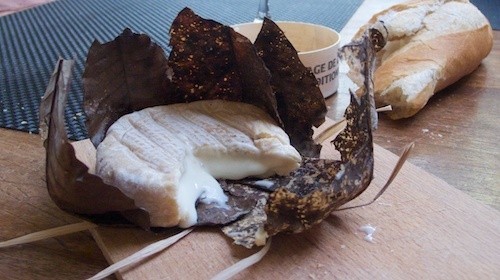 I untied the raffia string then carefully pulled away the dark chestnut leaves to reveal a velvety soft cushion of cheese. The goaty aroma was truly splendid and when the blade of my knife bit into the rind, its unctuous centre glooped like lava onto the cheese board. We ate it for lunch with a baguette from Le Moulin bakery and a Mt Difficulty ‘Roaring Meg’ Pinot Noir. It was an ill-chosen match. The goat so completely overpowered the grape, it was like drinking water. We gave up on the wine and savoured the cheese. My French cheese book tells me it should be partnered with vin de cassis, which makes perfect sense when you read on and discover banon is soaked in eau-de-vie before being wrapped in leaves and left to ripen. It packs a punch. The book goes on to list the characteristics of le banon, its creamy yellow ‘croûte’ and a ‘pâte’ that’s ‘homogène, crémeuse, onctuese et souple’ – in other words, bloody brilliant.